MOLLUSCA : NUDIBRANCHIA : Calmidae SNAILS, SLUGS, ETC. Description: This nudibranch seems to exist in two forms, one with long cerata and the other with short cerata. The cerata are arranged in up to 12 neat clusters with 4 cerata per cluster. The form with short cerata is almost colourless, with yellow-brown digestive gland and faint creamy rings on the cerata. 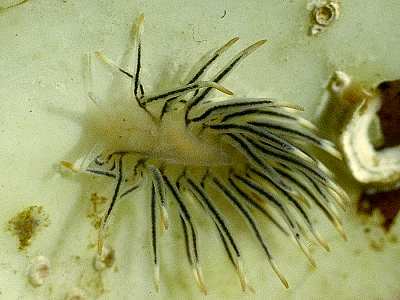 The form with long cerata, on the other hand, has bluish-white pigment over the ceratal surfaces, and yellowish tips to the cerata, oral tentacles and rhinophores. The foot is broad, with well-developed propodial tentacles. In mature specimens the rosette-like structures of the ovotestis show clearly through the transparent back. Grows to about 23mm in length. Habitat: Feeds on the eggs of cephalopods and fish, especially those of gobies, blennies and clingfish. These eggs are usually laid beneath rocks or shells, and as many as 50 or 60 Calma have been found on a single batch of eggs. A fine spiral ribbon of eggs is laid amongst the fish eggs. Distribution: Few British records, mostly from the south and west coasts but also recorded from Norway and the Mediterranean sea. Numerous cerata in groups of four along sides of body. Transparent body with ovotestis lobules showing through back. Short colourless cerata, or long bluish cerata with yellow tips. Picton, B.E. & Morrow, C.C. (2016). Calma glaucoides (Alder & Hancock, 1854). [In] Encyclopedia of Marine Life of Britain and Ireland.